The Penn Kingsmen Hockey Team faced off against the St. Joseph Indians this past weekend looking to capture the win on the Kingsmen’s senior night. This would be the final time the Kingsmen and Indians would play each other within the regular season for the seniors. 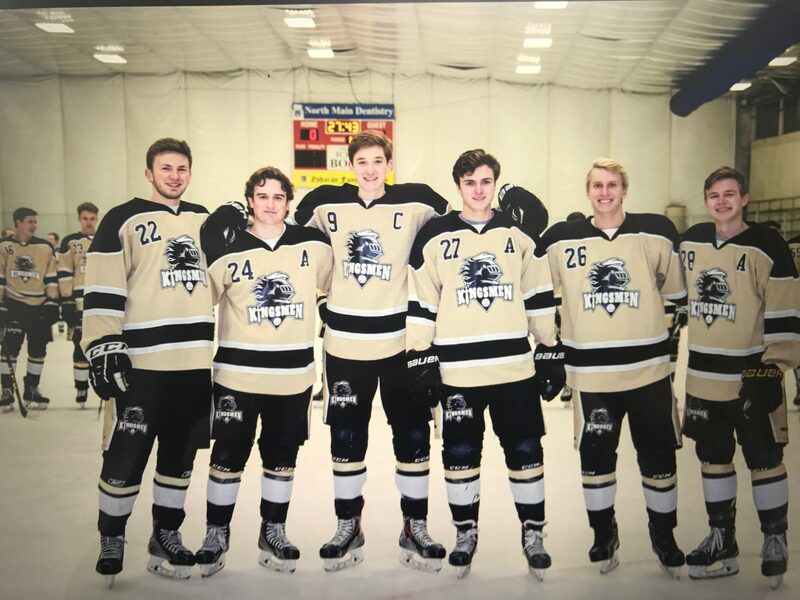 This year’s seniors include Carson Cocquyt (9), Colton Shail (21), Chris Philipson (Manager), Nick Morlan (24), Charlie Platt (27), and Jordan Lindzy (28). St. Joe started off the scoring early in the game with two unanswered goals putting the Kingsmen down 2-0 going into the second period. However, Penn battled back an buried one before the Indians would fight back and score two more goals. The Kingsmen fought back with only 0.3 seconds left in the period to put the game at 4-3 in favor of the Indians. When they came back out for the final period, the Kingsmen were able to score once more only one minute into the third. However, this was not enough to come back and tie the game as the third period would remain scoreless after that and the Kingsmen would fall to their rivals the St. Joseph Indians on Senior night with a score of 4-3. Goals were scored by Senior Charlie Platt assisted by senior Jordan Lindzy, an unassisted goal by Junior Degan Ross, and Freshman Ethan Matthews assisted by Junior Nick Harman. The Kingsmen have recently found out that they were placed in the 4-A Class for state and will need to defeat No. 1 ranked Culver Academies, No. 4 Carmel, and No. 5 Zionsville in order to make it to the state finals.